Arkstone Mill are organic growers licensed with the Soil Association. 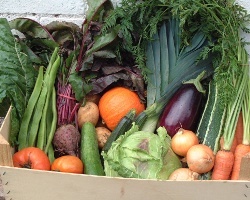 They supply boxes of organic vegetables, fruit and eggs to Hereford and surrounding villages, including the Golden Valley, delivered to your door. If you order a box at least £15 in value, you can select the contents of your box via email. For all box sizes they will exclude any vegetables that you don’t like, or grow for yourself. See website for how to order and further information. Their box scheme has been running for over 15 years and is an economical way of buying organic produce while cutting down on the food miles. They grow over 70 varieties of vegetables on a smallholding in Kingstone, and all bought in produce is certified organic.